Rev. Chuck Mitchell of Dobbins UMC in Delanco Township felt a debt of gratitude to the first responders in his community. Knowing that the men and women of the police, fire, and EMT squad dedicate their lives to the service of protecting others, he decided to dedicate a ceremony to honor them. Delanco Township clergy blessed their community’s police officers, firefighters and EMS workers at a “Blessing of the Badges’ ceremony on Dec. 13 at Dobbins Memorial UMC. Mitchell partnered with Rev. Donshae Joyner of the Delanco grassroots ministry ‘My Father’s House’ in facilitating the service which included prayers for first responders and remarks from clergy and Delanco Mayor Kate Fitzpatrick. Joyner, an African-American pastor, joined Mitchell in sending a message of peace and unity. Dobbins UMC youth leader Dave Gannon assisted by anointing the foreheads and badges of the first responders and praying with them. He also serves as Chaplain of Hope Hose Station 122 in Beverly where he has volunteered since age 17. In the midst of recent political turmoil and negative police stories in the national news, the ceremony was intended to display trust and appreciation for the work of the first responders. “We as a community should come together and ‘Bless the Badges’ to let them [First Responders] know that we stand behind them, value their service and pray for their safety,” Fitzpatrick said. Mitchell was inspired by a similar event organized by a colleague in Moorestown last September. Although the ceremony is spreading nationally, he was unaware of another community in New Jersey other than Moorestown that had participated and decided to start with Delanco. According to Mitchell, the service was less about religion and more about showing gratitude and support for the first responders. He noted that unlike veterans, first responders do not have a formal day of acknowledgment. Delanco Chief of Police Jesse DeSanto felt “truly appreciative” of the service and praised Mitchell and Joyner for their joint-effort. Delanco Fire Department Chief Robert Hubler Jr. and Matt Bartlett of the Emergency Squad were also in attendance and spoke about how much they value their community. The fire department and the EMS squad, both made up of trained volunteers, organize fundraisers that serve as the primary source of income for their operations outside of responding to emergencies and continuing their training. The ceremony featured a theme exploring the origins of badges and how they came to be. 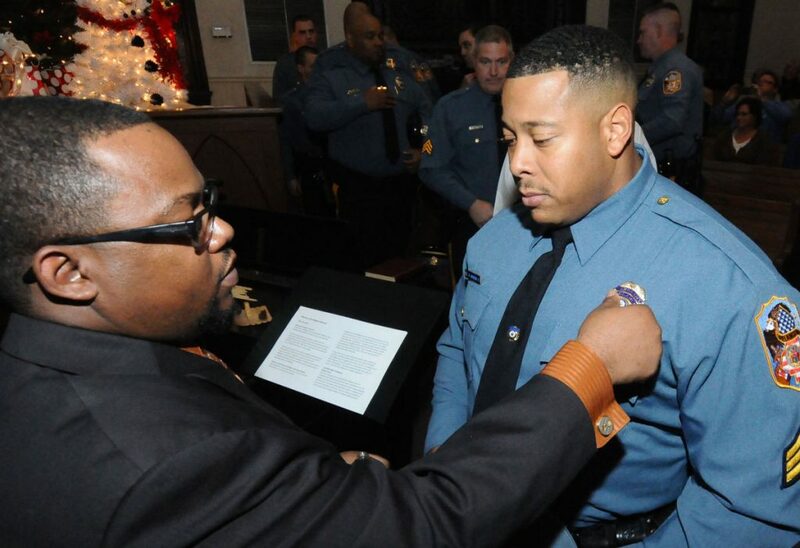 For first responders who were unable to attend, their badges were anointed. Police, fire and EMS retirees, church members from the small, tight-knit community, as well as clergy and laity, made up the gathering of about 100. Desanto noted that he and the 12 members of the Delanco Township Police would usually feel uncomfortable in the limelight, but felt a sincere appreciation for what was done for them. “It was well worth our time,” he said. Mitchell’s aim was to focus the service on blessing the officers with the patience and courage needed to perform their jobs.